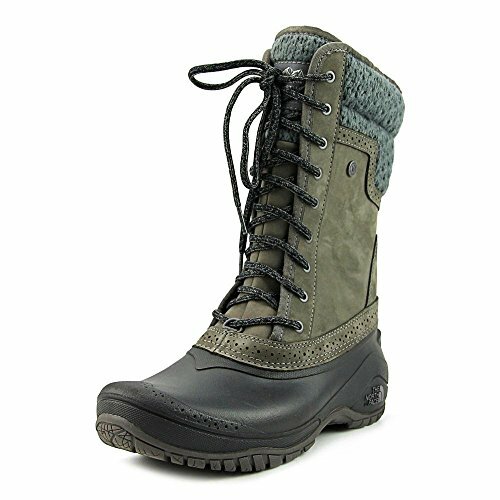 Mother Nature has nothing on you when you face cold weather in The North Face® Shellista II Mid boot. Waterproof, BLC-compliant nubuck leather uppers. Gender-specific, injection-molded, waterproof TPR shell. Knit textile collar. Lace-up closure. 200 g PrimaLoft® Silver Insulation Eco keeps feet warm. Durable TNF Winter Grip® rubber outsole with temperature-sensitive IcePick® lugs for exceptional traction in cold-weather conditions. Waterproof construction. Imported. Measurements: Weight: 1 lb 6 oz Shaft: 10 1⁄2 in Product measurements were taken using size 9, width B - Medium. Please note that measurements may vary by size. Weight of footwear is based on a single item, not a pair.